Len Margolin joined the Los Alamos Mountaineers in 1969, and very kindly provided us with this section on the history of some of our climbing and mountaineering equipment. Many things have changed since I joined the Mountaineers, mostly for the better. Newer members of the club may not have thought much about how the state of the art, in terms of clothing, equipment, guidebooks, etc., affects their climbing experience and opportunities. Below I describe some of this environment of my early days, hoping that some club members from even earlier days might add to these notes. There is no motive or message in these notes, nor any intent to compare the climbers of different eras. It is simply, as stated in the title, a matter of providing the visitor to this website a perspective to better understand the history of our club. In 1970, there were no specialized rock climbing shoes. Most of the experienced climbers used medium weight hiking shoes, which had rigid soles but were heavy and clunky. Beginners often started in running shoes, which were more comfortable, but whose flexible soles were generally useless for the thin edges of our basalt cliffs. It was 1971 when George Bell first came to the climbing school with his brand new Royal Robbins climbing shoes. RRs combined a rigid sole with lightweight uppers. The narrow welt permitted edging on the thinnest structures. On the downside, the shoes were narrow and were supposed to be worn tight. The original soles were very hard rubber, which tended to track up kitchen floors and didn't last more than a single season. Worst of all, the shoes were ostentatiously royal blue and came with bright red shoelaces. Despite these disadvantages, soon all of the serious climbers wore RRs. Many of us changed out the red shoelaces. The approach to the Brazos Cliffs in RRs was very painful, and the sharp quartzite rocks of the descent gully chewed up the soles rapidly, so many of us began wearing sneakers to the bottom of the cliffs and lacing up our boots on the first moves. After the original soles wore out, some of us experimented with softer replacements. There was only one shoemaker in the area who would work on the RRs, Steve Komito in Estes Park, Colorado. He was very busy and sometimes one would make an appointment more than a month in advance. Helmets were required on all technical club climbs. If you carried a rope, you wore a helmet. This was a sensible reaction to the accidents of the 1960's, where several deaths were attributed to lack of helmets. The club had a stock of loaner helmets; these were plastic shells with a plastic suspension. They were hot, uncomfortable and had a tendency to slip forward over the eyes at the most inopportune times. The more experienced climbers had Bell Toptex helmets, a shiny white shell with padding and a lining inside. These were even hotter, but more stable. They must have been effective, because most of us could point to many dents in the outer shell and tell the stories that accompanied them. However, it turned out that Bell had designed these helmets for surfing, and when they realized they were being used for climbing, took them off the market. We were still in the piton era in the early 1970's. Chrome moly pitons (see Fig. 1) had replaced soft iron pitons; the harder new pitons were much more reliable in the granite of the Sandias and worked okay in the Brazos. However, I remember trying to remove an old fixed iron piton on the lower pitches of Easy Ridge, working in vain for half an hour. In the mid 1970's, climbers started to notice that the cracks on many popular climbs were being destroyed by the constant placement and removal of pitons. I remember a thin crack climb in Yosemite (Serenity Crack) that had been an aid route, but became a free route when the piton scars became wide enough to use for finger holds. This concern led to the first chocks, marketed by Chouinard. These were steel and heavy, and many of us drilled holes in the larger chocks to reduce the weight. In 1970, Plymouth goldline, a woven nylon rope, was the "gold standard." (A goldline rope is visible in Figure 3 of the Brazos section.) Climbers who have never used goldline have missed an interesting if unpleasant experience. No matter how carefully one coiled a rope at the end of a climb, the next time out it was spaghetti. Several times, the rope kinked in my belay plate while rappelling; this is a very awkward situation if you have no way to temporarily take the weight off the rope. Another unpleasant feature of goldline is its stretchiness. While perlon has a nonlinear response with almost no stretch at small loads, you had to get at least ten feet up to avoid a groundfall when belayed on goldline. I recall a particular episode at the Overlook, when an unlucky climber did not get high enough on the Cholla Wall before peeling, and so had an intimate experience with the large cactus that used to grow at its base. The development of perlon ropes was indeed a blessing. In the early 1970's, a company named MSR (Mountain Safety Research) began to look at climbing equipment with a more scientific eye. Ice axes then were still made of wood with a metal head. 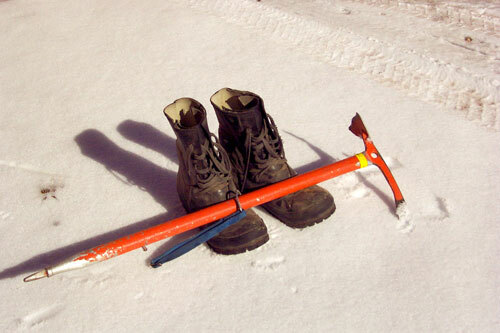 MSR marketed an ice axe entirely made of metal and painted bright orange (see Figure 2). I don't know whether the new ice axes addressed a serious safety problem, but soon most of the mountaineers sported the new axes. It appeared that the thorough research of MSR did not extend to the orange paint, which had a tendency to bleed when wet. Owners of the new axe were readily identified by their matching orange gloves. MSR did address another piece of technology that I think was more pressing. In those early 1970's, there were many models of gasoline-fueled backpacking stoves. These were quite varied, but had one thing in common, which was their lack of dependability. Cold uncooked oatmeal does not provide a good start to a strenuous day. In frustration, some of us went to a French stove termed a Bluet, which used propane cartridges. These were more dependable, though on cold mornings one had to remember to bring the cartridge into the sleeping bag to warm it up. I used my Bluet for several years, but then reports of explosions and tent fires began to surface. When MSR put out its first gasoline stove, it proved a satisfactory solution to all these problems. In 1970, there was no Goretex, no artificial insulation like fiberfill or polar guard, no polypropylene. What we had was down, which was effective if you could keep it dry, and wool. Polyurethane ponchos were absolutely waterproof, but did not breathe and trapped body moisture. Some of the climbers carried umbrellas in the mountains, which worked well if there was not too much wind. I did my first winter climbs in wool knickers, which were stylish in some retro sense, but totally uncomfortable. In the mid 1970's, a small company started up in Santa Fe. Altiwear used foam to make innovative winter camping products like parkas and sleeping bags. I bought the third sleeping bag they produced; it worked as advertised. Then I bought a jacket and pants, and I used them on a winter trip to the Spanish Peaks. The foam equipment kept me warm and dry, with no itching or irritated skin. When I came home, I threw away the knickers. I still have the sleeping bag. Altiwear achieved some international notoriety when a Himalayan expedition used their equipment. Unfortunately, they were eclipsed by the introduction of newer and more comfortable artificial fibers and went out of business. There was at least one piece of equipment from the old days that worked really well, what we called K-boots or Mickey Mouse boots (see Figure 2). Many of the Los Alamos Mountaineers had expedition experience, including trips in 1966 to Antarctica and 1971 to Greenland. Also George Bell and the Liskas had climbed in the Andes and the Himalayas. For such expeditions, leather boots had some serious drawbacks, mainly associated with keeping them waterproofed. We used a product called snow seal to waterproof leather; this was messy and had to be frequently reapplied. Snowseal was waxy, kind of like artificial bear fat; the most effective way to apply it was to spread it on the boots and then put the boots into a warm oven. Not too warm, though, as some climbers discovered. Eiichi Fukushima turned me onto K-boots, which were actually Korean War surplus boots made of unibody molded rubber. They came in two models, black and white, and two sizes (big and bigger), and in those days could be found in army surplus stores. Of course, you couldn't just use them off the shelf. 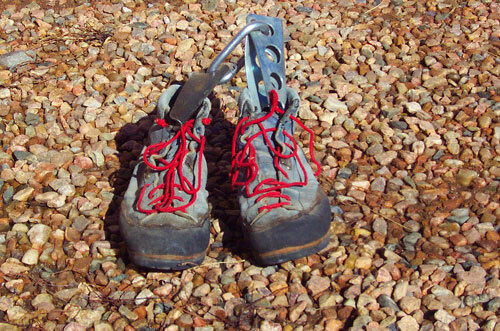 K-boot soles had no tread and were too flexible to use with crampons. So they had to be resoled with a more rigid bottom. The boots were very large, and it was difficult to find crampons that fit. Don Liska once told me that no one had ever gotten frostbitten toes in K-boots, but wrinkled skin and blisters were a problem because of excessive sweating. He recommended a very heavy "Indian" sock to absorb the sweat. I ordered a pair, but they were scratchy wool and I couldn't wear them. I still have the boots and wear them occasionally. I also have the socks, still unused, which I will sell to anyone at cost. We now live in the information age. Climbers argue the merits of the many guides to Colorado's fourteeners, some of which now contain CDs with topo maps and GPS coordinates. Life was simpler in 1970, when Ormes "Guide to the Colorado Mountains" was the only source. In my copy of his sixth edition, Ormes covers all the mountains in Colorado in under 300 pages. Difficult mountains, like Capitol Peak, merited nearly a full page and a hand drawn map. Easier fourteeners, like Bierstadt and Evans, got only a brief paragraph and shared a hand drawn map. Of course, Bob Ormes hadn't climbed all of these peaks himself; much of the information was culled from reports of other Colorado mountain climbers and was never verified. Consequently, climbing trips sometimes uncovered errors that we noted in our books and shared as needed. Ormes' book also contains some interesting notes on geology and history of the Colorado Mountains.